Very nice one Sam - I love the wide field, but still plenty of detail in there too. You didn't get on with the Quattro 10 then? Thanks! I thought I'd attach a 100% crop of the galaxy (0.94"/pixel) - which is fairly unforgiving for most images, especially mine. The answer is infrequently and with a collimation cap - I have a laser collimator but have never used it. When I received the 'scope it was fortunately well collimated and I only adjusted the primary. Still happy with the collimation, although the 460ex isn't a huge sensor. *of the year* - my second ever image was awful! Thanks though - yes I really like the combination of MN190/460ex. Having only finished my first image of the year about a week ago, incredibly I now have a second one. We should try to remember that we do get decent weather in the UK sometimes after all! NGC 2841 is a neat little galaxy in Ursa Major. I say little, but it's actually similar in size to the Milky Way. The tidy appearance suggests that it hasn't had any recent interactions with its neighbours and apparently has a low rate of star formation. There's a nice variety of faint fuzzies in the background, which I particularly like about this area of the sky. Sorry to post again, but I realised I'd messed up the core with my Ha layer, now fixed. Why can't I get it right first time! Maybe you didn't notice, but it's really bothering me since I realised! Thanks all. I feel the image got a bit noisier when I exported, even though it is .png which seems to give the best results. @SamAndrewThanks - I'll be very interested to see what your result is like! 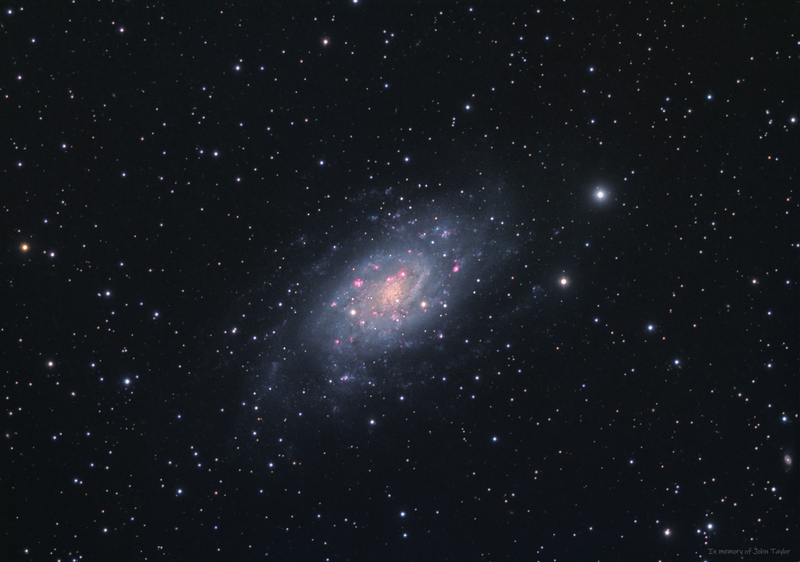 Here is my completed image of NGC 2403, captured in LRGBHa. It's taken some time to get all the data together and process. In fact, I think this is the first image I've managed to produce at all this year due to some circumstances. Strangely, you don't seem to see NGC 2403 as frequently as it deserves - it's actually quite a decent size in the sky and is visible all year round from the UK, albeit a little low in the summer. 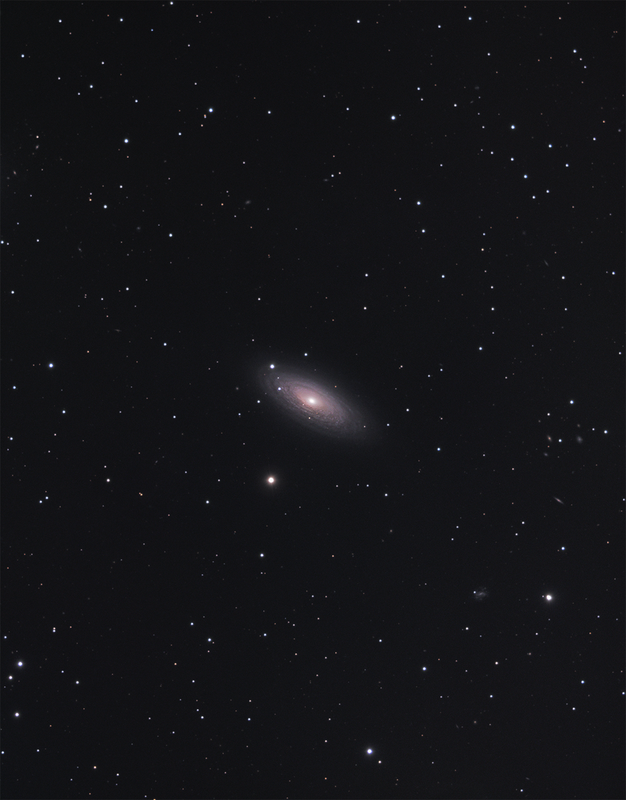 It's part of the M81/M82 group and, being face on, it does look somewhat like M33's little sister! The Ha really adds a lot to the galaxy, there's lots of interesting HII regions and I've tried my best to blend those in. I also tried capturing some shorter colour data for the stars, but my haphazard processing skills have let me down as it didn't seem to add much. Excellent! I don't know how you achieve so much excellent detail & colour without much data. I might have to copy your obsy cam - I do have a Blink camera pointing at the scope but can only view it intermittently on my phone. What have you used for yours? Very nice - more of a "6" than a question mark imho! I've been meaning to try out NINA for some time, but find myself stuck in the "it works, don't fix it" hole at the moment! Fantastic! It's absolutely packed with excellent structure. 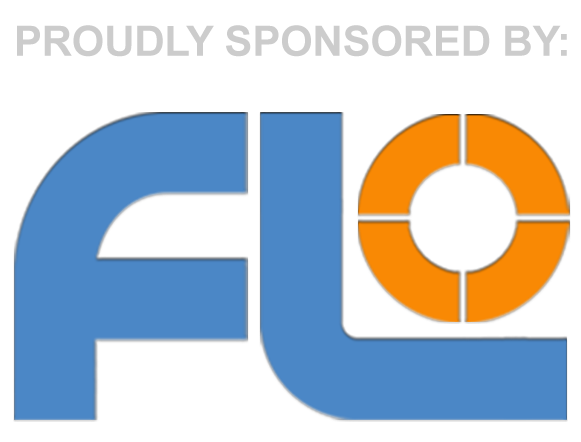 The upload has suffered a bit from compression - I can see it's a PNG now, but was it a jpeg at some point? Sorry to bump an old thread, but I was considering my options as to using an LP filter (such as the newer IDAS V4) to improve my luminance data. I have fairly heavy LP and currently just shoot through an L filter. I find it difficult to extract faint details due to this, even with large volumes of data. Very nicely done indeed. Added to my home screen, thanks! Do plan to add DSOs to the atlas?